I am having a hard time renaming some of my dishes. I swear, vegan food does not need to be a recreation of something dairy or meat-laden. It can just be. Wonderful, in all its glory. Nameless. While exploring our new neighbourhood, Rob and I discovered new ethnic grocery stores, including a few that carried black salt or kala namak. More pink than black, this salt has been infused with sulfur, rendering an egg-like taste when used in cooking. We immediately made Besan Chilla (also known as cheela or pudla), which technically is an Indian chickpea-based crepe or pancake. However, I first spotted the recipe on Julia’s blog where she called it a chickpea flour omelette. Omelet or pancake? Rob and I disagreed. The only thing we agreed on was that it was delicious. Analogies work well when trying to convey a new concept, and for me, these reminded me of a savoury pancake. Too thick for a crepe, too pancake-like to be an omelet. 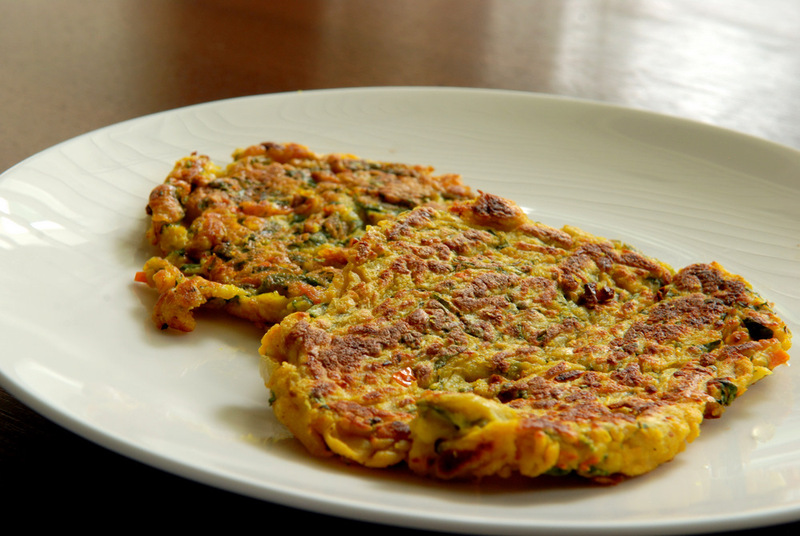 We stuffed the chickpea flour-based pancakes with savoury spices (ginger, garlic, onion, turmeric, chili flakes) as well as vegetables including tomato and spinach. Broccoli stems work great, too! Really, pick your favourite veggies ad run with it. The addition of black salt conferred an egg-like taste, which is why this could be described as something similar to an omelet. Rob can whip up a mean omelet. An egg-based one, though. He did not feel that this version warranted being christened as a vegan omelet, as is. He has vowed to tinker with the recipe, to make it more akin to a traditional omelet. Until then, I couldn’t wait to share the recipe with you because it was really tasty just the way it is. Whatever name you want to attach to it. Besan Chilla, it is for now, with the wonderful black salt. Wonderful for breakfast, or as a light lunch. Mix things up with your favourite spices and vegetables. Serve as is, with chutney on the side, or as a side to a more complete meal with Indian dishes. This is my submission to this month’s Bookmarked Recipes and to Ricki’s Wellness Weekend. 1. Mix chickpea flour, onion, garlic, ginger, tomato, turmeric, black salt and chili flakes together. Add in enough water to create a pancake-like batter consistency. Mix well. Stir in spinach leaves. These look lovely! Do they resemble a bread or are they more like a flat bhaji? I’ll definitely try making them when I make my bhajis this weekend! We love Indian food! I don’t even know what bhajis are… but they taste more like a pancake than a bread, if that helps! They look like they would go perfectly with some yogurt and chutney on the side. Super inviting pancakes, loving it..
I’ve made lentil pancakes before that were out of this world! I bet these chickpea ones would be even better. I’m not really a fan of trying to convert non-vegan foods to vegan foods. I say let the vegan foods stand on their own! YUMMY! I have a huge bag of besan flour to use-up and these will be perfect. Congrats on making the Vegan MoFo round-up! Sounds delicious. I’ve made a type of chickpea pancake called Socca (from France) but adding the veggies is a new idea to me and I like the spices here too. lovely chilla.. and the kala namak is so needed! 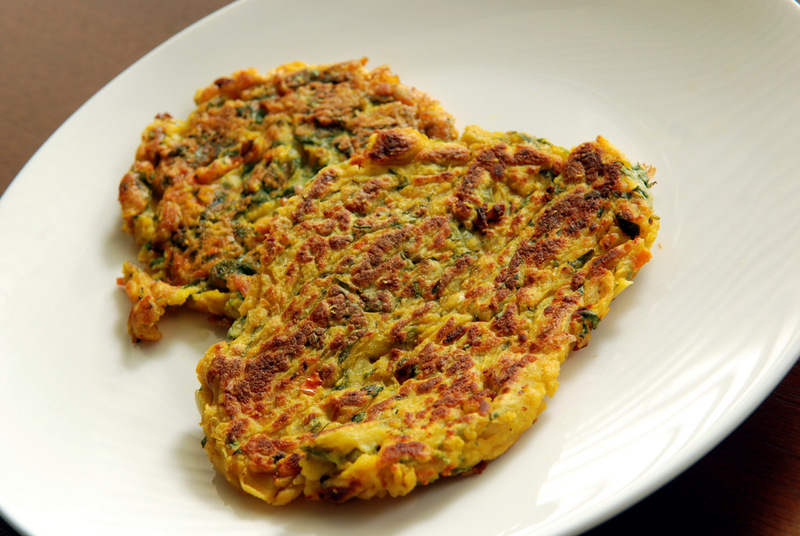 i was going to post a chilla recipe in my breakfast round up next week!.. we make it more like thick crepes instead of pancakes… and of course my mom;s always come out perfect and round, while i make mine any random shape! Chickpea flour pancakes have been on my must try list for a while. This recipe has definitely pushed them to the top, so versatile and great for using up leftovers, which I love!! Whatever you call it, this looks really good! I tried making a chickpea pancake before and it was okay but not perfect. I should definitely try again.